Here comes the new notification related to the UP Police jobs for Jail warder posts. UP Police recruitment for Jail Warder posts in various Jails all over UP state. 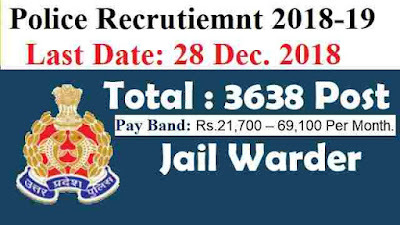 There are total 3638 vacancies which are going to be filled up through this UP Police Recruitment procedure. Both Male as well as Female Jail Warder vacancies are going to be filled up through this Police recruitment process 2019. UP Police all ready issued an official Notification for the recruitment of Police Constable posts, so those who miss out that post click on the following link: “ UP Police Recruitment for Constable Posts”. More information related to this UP Police Recruitment for Jail Warder posts is given below in this article, so read out the complete post carefully before applying. Pay Level: Rs.21,700 – 69,100 per Month. Pay Band: Rs.21,700 – 69,100 Per Month. In the table below we are going to explain the vacancies information according to various Categories. So check the table carefully to know more about the vacancies related to this UP Police Recruitment for Jail Warder Posts. Educational Criteria: All Indian candidates who have passed in their 12th class examination from a well-recognized education board of India can apply for this UP Police Jobs for Jail warder posts 2019. Age Bond: The Age criteria for Jail Warder posts are different for Male and Female candidates. Age Bond for Female: Age must be in between 18 years to 25 years. Age Bond for Male candidates: Must have age in between 18 years to 22 years. The candidates who are wishing to apply for these Government jobs under Police department have to pay the application fee of Rs.400 though online mode. There is NO FEE relaxation for any category candidates. Everyone have to pay the same application fee for applying this UP Police recruitment 2018. Paying Way: You can choose one of the following Method for the payment of the application: “ Debit Card, Credit Card, Internet Banking (or) Bank Challan”. 8TH Dec. 2018 is the Opening Date to Apply. 28th Dec. 2018 is the Last Date to apply.